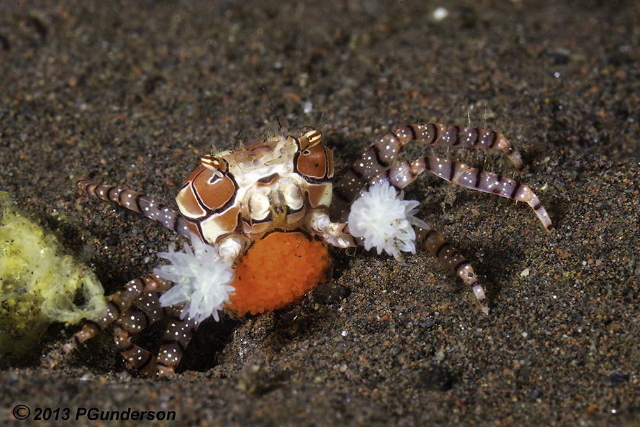 Boxer crab (Lybia tessellata) with eggs. Bali was a dive destination I had never considered prior to my first trip - a prize for winning 1st place supermacro in the 2011 Ocean Art Contest. 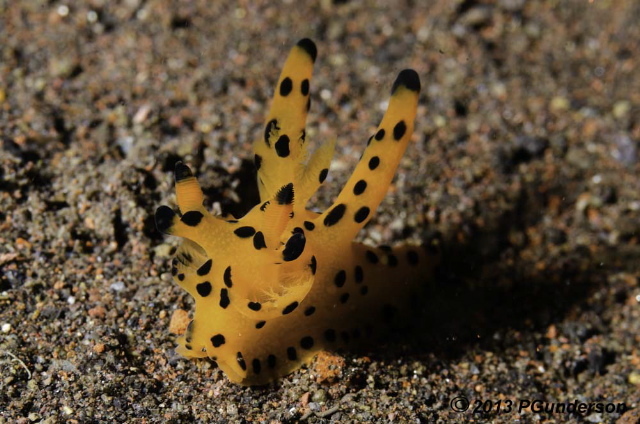 Looking back, it makes sense that the prize would be to a destination that was known for nudibranchs and supermacro photo opportunities. 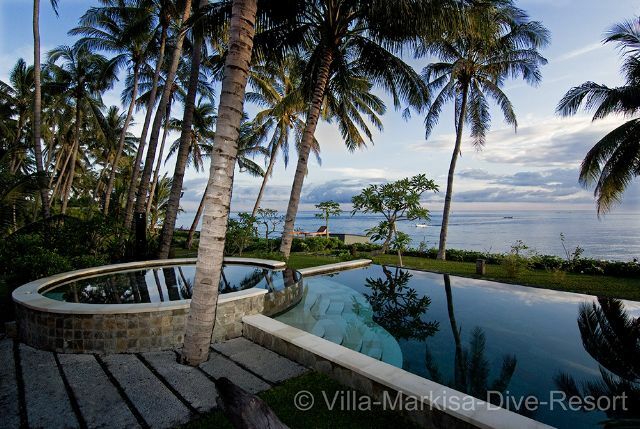 My prize was a week in a private bungalow at Villa Markisa in Tulamben, Bali. I had heard about muck diving in Indonesia, but having done most of my diving in the Pacific Northwest I really did not know what to expect. 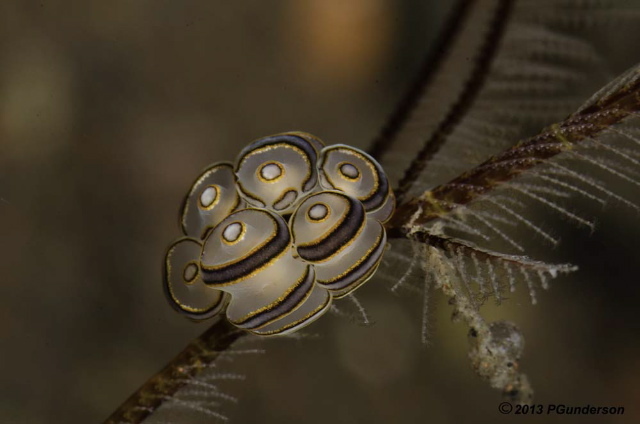 I took the trip and finally experienced the wonders of muck diving in January 2013, intending to visit different places and dive other areas of Bali. Plans changed after experiencing the great diving and the wonderful relaxing atmosphere at Villa Markisa, and we stayed at the resort until we had to leave for the airport. The bungalow was beautiful and comfortable, with lots of room to relax between diving, the food was great and the Balinese outdoor bathroom was a real treat. Lush foliage next to the shower made rinsing off from so many dives a pleasure. A view of the water from the pool at Villa Markisa. January is the low season in Bali and it rains in the afternoons, but I was very glad to have visited then and plan to go again at the same time of year when I get another chance. The conditions were wonderful for photographers. Since there were only a few people at the resort, the excellent service was made even better by the fact that often there were only two people diving. There was always something new to see and with the dive guides spotting critters there was no lack of photographic opportunities. A Skeleton Shrimp with an Interesting color. The much sought-after Donut Doto. 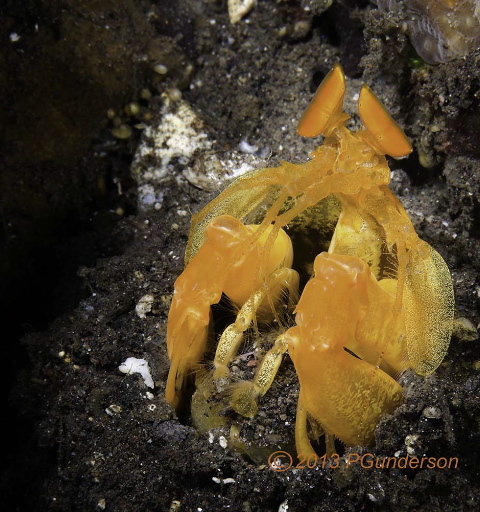 A Golden Mantis Shrimp. 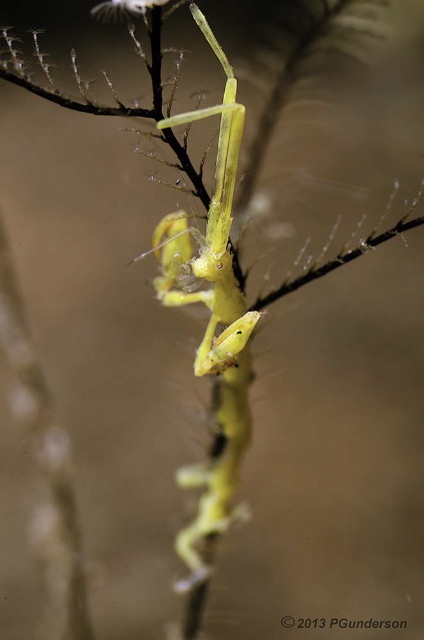 This species of Mantis comes flying out of it's burrow and spears it's prey - a sight I would love to see. A juvenile Tiger Shrimp with it's prey. 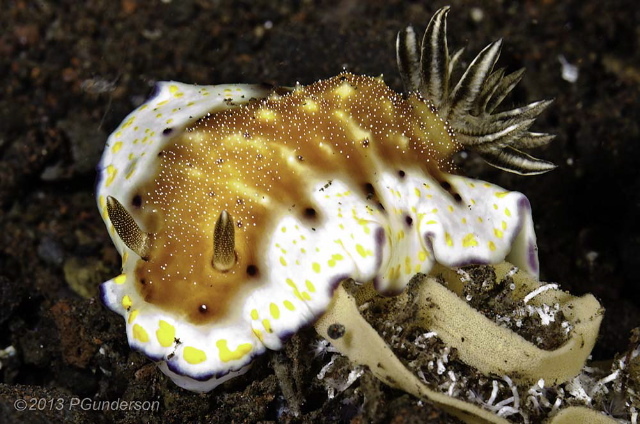 On every dive, the guides would point out far more critters and nudibranchs than I would ever be able to photograph on one trip. 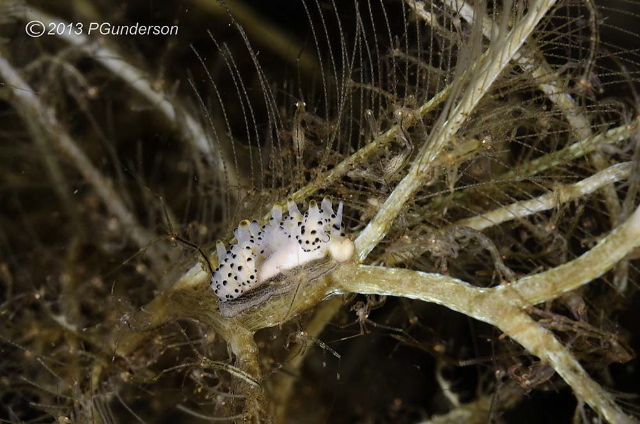 There were so many Opisthobranchs that it was difficult for me to choose a few to present in this article. 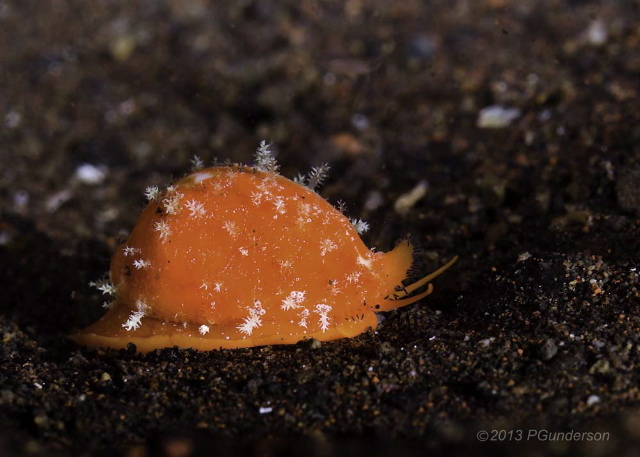 One of my favorites,Thecacera Sp. I have seen this species called Pikachu because of its appearance. 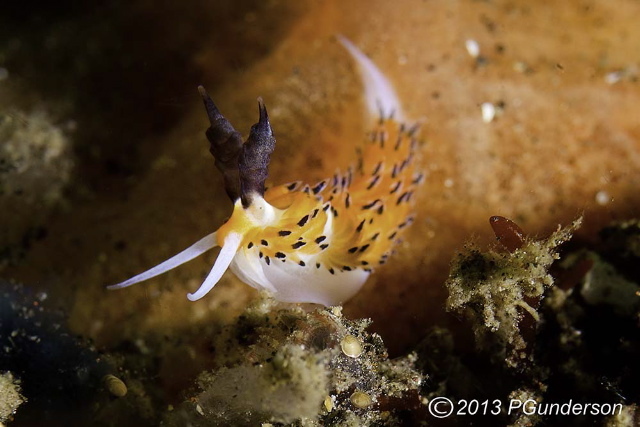 Cyerce kikutarobabai, not a Nudibranch but a Sacoglossa, which I am told is a rare sighting. Favorinus tsuruganus, with its spectacular rhinophores. My favorite diving on this trip was night diving on the house reef at Villa Markisa. The macro and supermacro life at night is constantly on the move and there was never any lack of interesting subjects. 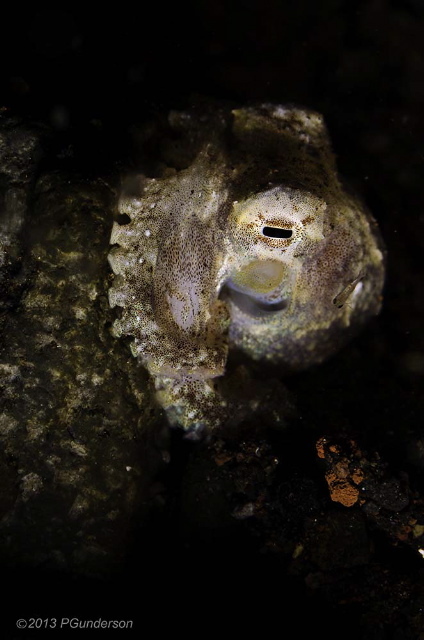 On one night dive I had to leave my camera behind and watched a Jawfish dance in and out of its den. I also saw many other critters I would not have seen if I were focused on the viewfinder of my camera. 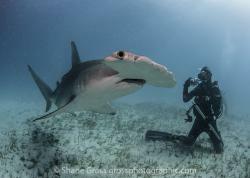 I am glad that I had this opportunity and recommend diving without a camera (once in a while) to all photographers. 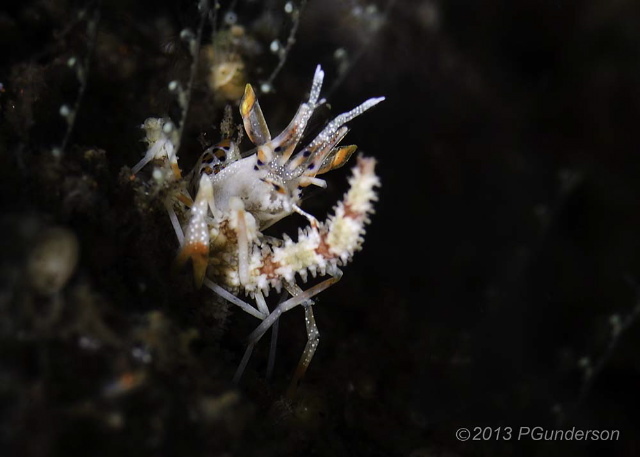 A Doto sp 7 surrounded by more Skeleton Shrimp than you can count. 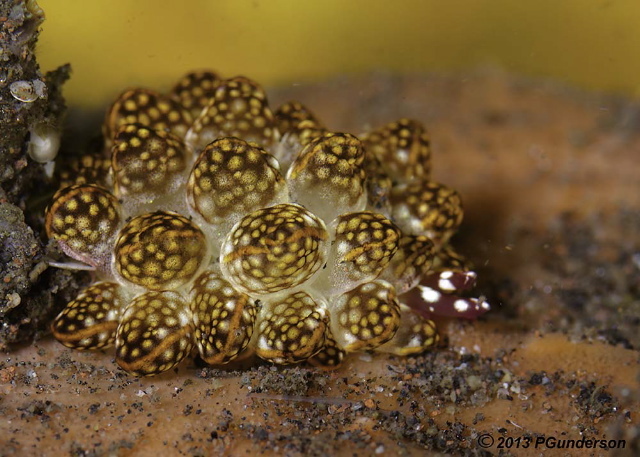 A striking Cowry that contrasts with the dark sand. Octopus were out and about hunting at night. This tiny Coconut octupus made a great subject. This tiny juvenile Marble Shrimp is my favorite critter from the trip. 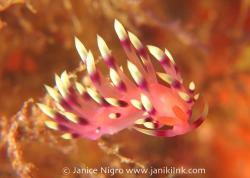 Our divemaster, Dharma, found it for me on my last dive, a night dive of course. 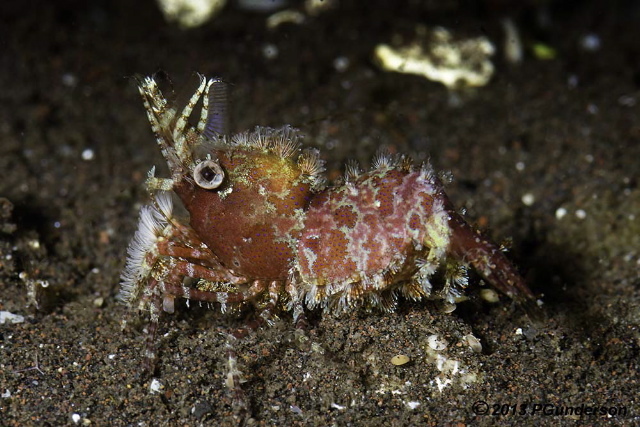 I have to say that the wide-angle opportunities were also excellent in Bali, but I have chosen to showcase the tiny muck-diving critters and night diving. If you choose to visit Villa Markisa you will have many photographic opportunities, great service and meals, and the opportunity to walk down to the beach beyond the dive center to some great muck diving and some of best night diving I have ever done. My thanks to Christiane and Pedro who were great hosts at Villa Markisa, and especially to Christiane for making sure I had the opportunity to dive a variety of sights with fantastic macro photography opportunities. My only regret was that I did not have more time there to better learn the behavior of the creatures I saw. 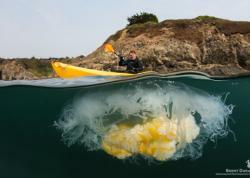 Ocean Art u/w Photo Contest 2013 - Enter Here!